Comments for Seaside California sea glass. There hasn't been much seaglass down there in a couple of years, not even IN the water as previously stated by someone else (who said the only way to get "good glass" was to get wet). That was false. That person sells scoops...The same person broadcast on the news where this location was, thus drawing a heavier crowd. I have an excellent collection from before things changed by simply walking along the shoreline at various tides. I had no theories of high or low tide at the time. It was random. Always found GREAT glass (rare colors, not white green and brown!) Those colors were there also, but I found loads of wonderful pieces. 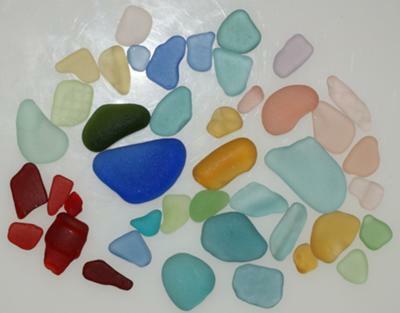 It used to be on the top 10 of best seaglass beaches. I'm thinking it isn't on the list right now. I would love to know where Seaside is? Hi Laurie! I'm putting a link in the original submission above to our other articles an Seaside. Absolutely beautiful....I think I'll try making a scooper - I thought about using a colander, but then I have to practically sit down in the water. Yes i find it among the rocks in the water but i use a home made scooper on a pole on a good day i can get about 10 to 20 lbs of glass. Today i went to the beach and got about 5 lbs in 4hrs all colors got 4 reds 1 orange and lots of other colors. Wow! All those rare colors!! How long did it take you to find it all and did you look for it among the rocks or in the water? Wow. So many reds!! Great finds!